If you have a little boy that is interested in dollhouses then you’ve come to the right place for our complete guide to the best boys dollhouses. It make seem uncommon for boys to like dollhouses but there are actually some options that are geared directly toward boys and we’re here to show you just that. In this guide we have a summary of each toy along with the pros, cons, what age it’s for and finally what makes that specific one stand out. If, after reading our list you’re still unsure about which one to get then you can check out our buying guide at the end that has even more details about dollhouses for boys which will help you with your buying decision. 14 What makes for a good Dollhouse for a Boy? With helicopters, police officers, motorcycles and fire trucks this dollhouse is a fantastic option for young boys. It’s quite large with 3 stories and 12 total rooms which makes for lots of difference play scenarios for your little one. It also comes with a super cool full firefighter’s pole that goes from the top to ground floor. 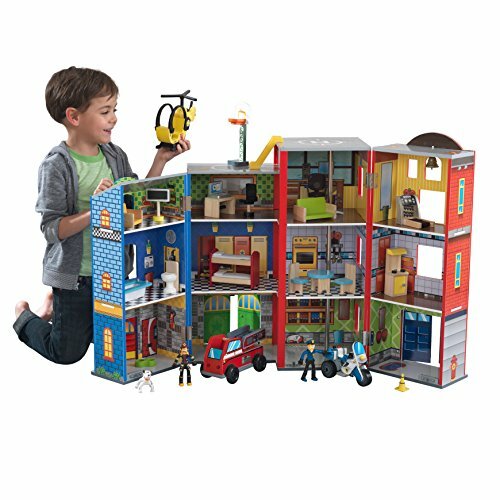 This boys dollhouse is one of the biggest we’ve seen and also comes with so many different pieces to keep boys entertained not only for a day but for years to come. 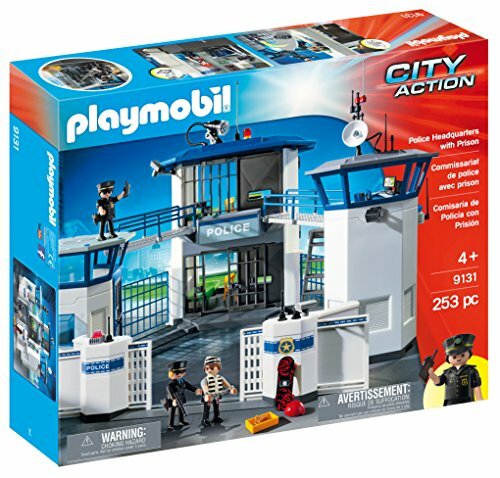 The cool thing is that they can have fun with the firetruck, police car, helicopter and other characters apart from the house which means that you actually get a bunch of toys when buying this. 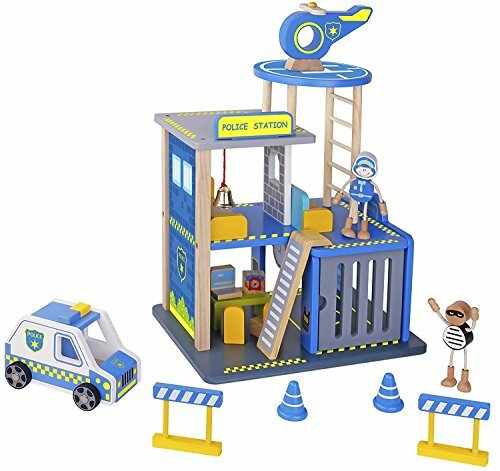 This boys wooden dolls house is another excellent option for boys and comes with a police officer, police car, helicopter, a burglar and many more accessories. Including the burglar was a great idea as it allows for creative play scenarios for little boys that often love playing cops and robbers. Your boy can play the hero and have the cops save the world from the evil crook. This dollhouse is unique with a working garage door and a bell that kids can ring to alert the police. This makes for more great pretend play and development of their imagination. It is also general natural so if you have a little girl she will love it too! This pack and go castle is a great option if you’re looking for something simple for your boy. It comes with just 6 play figures and all of which are made of wood. It’s easy on the go design with carrying handle make it a great toy to travel with. Beyond the king and queen is comes with 2 knights, 2 horses and a few accessories for the castle. These provide for nearly unlimited imaginative play opportunities for your child. Simple, easy and affordable this boys dollhouse is great for parents looking for an option that isn’t as complex as most doll houses. This means it can work great for younger kids who need a more simple today to play with. Boys have been loving the pirate theme of this playset. It is very large meaning that several kids can play with it at the same time allowing your son to learn how to share. It comes with a separate pirate ship and lookout tower which can be played with their own. It also comes with a treasure chest that lights up when you push a button providing for some interactive play. There are many other awesome accessories this toy comes with including 2 light up cannons, pirates, a jail cell and more. This pirate toy house is one of the most complete and largest ones we’ve seen with 3 separate toys including a pirate ship, lookout tower and the dollhouse of course. It also provides for interactive play with several light up toys. This lego set is clearly not a dollhouse in the traditional sense but for boys it is a great option. Kids can build this house from scratch with 69 different pieces allowing them to creatively build the house in different ways over and over again. There are enough pieces to build 3 stories and it include figures for the whole family a mom, dad and child. Beyond this it even has a car so your kid can imagine the family driving away to wherever they make go. 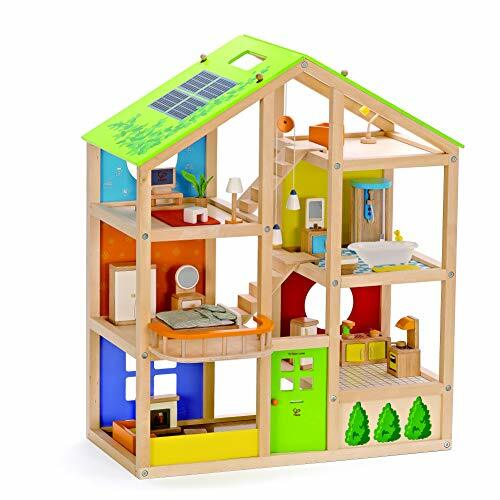 The 69 pieces are enough to allow your kid to build a different type of house each time they play but also not overly complex for them like some dollhouses can be. It comes with the time tested and trusted quality parents have come to know and expect from Lego. This is another police hero set, which are very popular among boys. 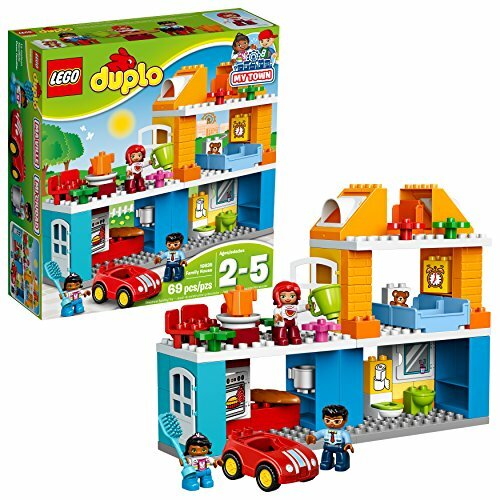 Although it’s not a house this set gets at the same idea with mini figures that allow for a similar imaginative play experience. The dolls in this set can sit, stand, bend and even turn their heads making for a realistic experience. Coming with over 250 pieces it’s an incredibly complex toy that your kiddo can have fun with for years to come. We liked how this set is compatible with other PlayMobil sets so if you’re kiddo starts to get bored you can go out and grab one of the many other excellent PlayMobile toy sets and add it to their collection. This is your classic dollhouse that both boys and girls love with it’s gender neutral colors. It is a fairly large dollhouse that comes with 3 stories, 6 rooms. The house comes fully furnished with 4 sets of furniture so you don’t have to go out and buy extra dollhouse furniture to fill the house. We liked how this boys dollhouse comes with solid wood construction meaning it will last for years. It was also great that it is open on all sides making access and play easier for your boy. Boys love playing with this medieval castle dollhouse. 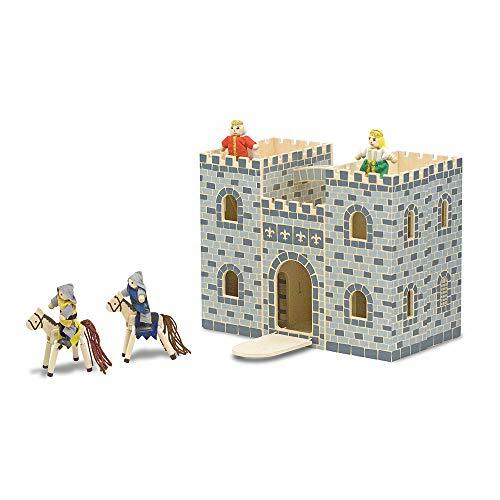 They enjoy the pretend play experience of imagining they are in the medieval times of ever constant battles with enemies trying to invade and take over the castle. It comes with several cool features we haven’t seen in another dollhouse including a trap door and drawbridge. With a name backing it like Melissa & Doug you can’t go wrong with this toy. 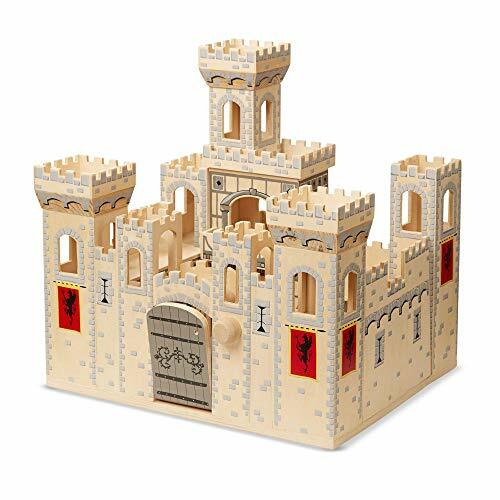 This castle is made with a beautiful elegant design and high quality wood meaning that it will last for years to come and can be passed on from sibling to sibling as each one gradually grows out of it. 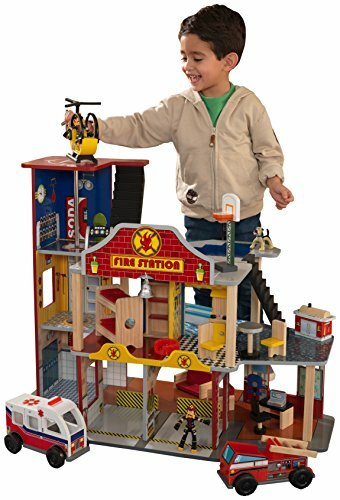 This fire house comes with 61 pieces including a real walkie talkie, two fire trucks and much more. The real walkie talkies allow for an enhanced experience making for stronger imaginative play. 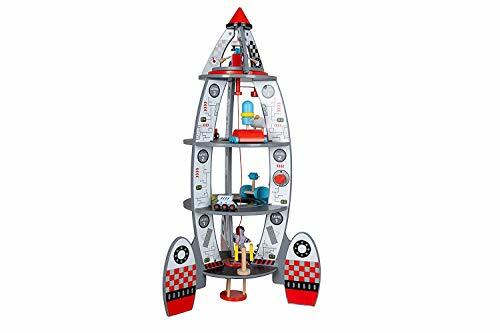 It also has a screwdriver and bolts so you can put your son to work building it, helping him develop his fine motor skills and hand eye coordination. With the 4 traffic signs your son can begin to learn important skills like ‘looking both ways’ when crossing intersections and understand how stops signs work. We really like how this one is simple enough to assemble that children can use it to practice their fine motor skills. Boys will also love the siren and flashing light that the fire truck accessories come with. This is another dollhouse kit for boys, that is also ideal for girls with a neutral theme and colors. Though it’s rare, not all boys love police cars and firetrucks so this is an alternative if your boy is one of those. It is open on all sides making for 360 degree play that lets several kids play at once. It comes with the whole family and a bunch of home accessories. A unique thing we saw with this dollhouse is that it comes with decals that kids an decorate the house walls with. It also has a working door bell and porch lights and even toilet that makes a flushing sound, all of which can enhance the realistic nature of this toy. Your son will love this army command center house that comes with 2 levels, a bunch of soldiers and even more accessories. The set is made from strong plastic materials that are free from toxins. Another cool thing about this set is that it is compatible with many other Clikc N’ Play brand military sets meaning you can add to your childs collection over the years. 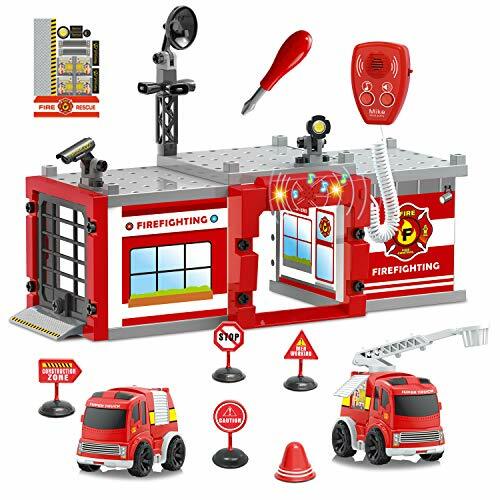 This is another fire station set that boys have been loving. It comes from a trusted brand in KidKraft and is quite large at nearly 3 feet wide and just over 2 feet tall. It comes with a helicopter and landing pad which boys always love. It also comes with a bunch of pieces of furniture and 2 firefighters. 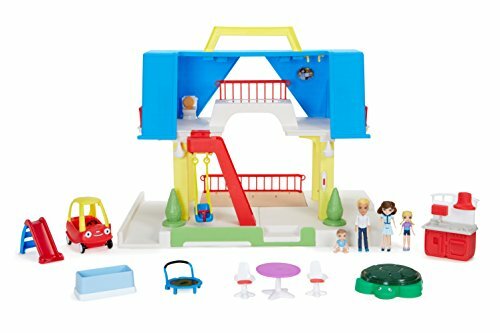 This is large and very versatile boys dollhouse that comes with a bunch of accessories and toys to furnish the house with and can even be played with without the house. We loved the 2 fire trucks that come with the house. Although dollhouses are traditionally thought to be for girls, boys love them too! Picking one out for them can be hard and we understand. It’s important to remember that boys like nontraditional ones. In our guide above we covered some of the top options that your little boy is sure to love. Below you will find a buyers guide to help you if you’re still having trouble deciding which one he will love. What makes for a good Dollhouse for a Boy? Choosing the best dollhouse for boys can be a delicate process. Get one that’s too ‘girly’ and has any pinks or purples and he may not like it, always think ‘neutral colors’. Typically boys love ones that are police or firefighter themed. Boys also love ones that include cars, trucks or even helicopters. It’s really pretty simple and you can usually get a gut feeling of whether your boy will like specific ones when looking at them. Both types of dollhouses are available though furnished ones are much more common. In the end it’s up to you which one you choose, remembering that you’ll likely have to buy some extra dollhouse toys to fill the house if you get an unfurnished one. If your son already had a tons of small toys that are themed towards the house then an unfurnished one may actually be a better choice. Dollhouses for boys may not sound like the most traditional boys toys but they can actually have a ton of fun with them. 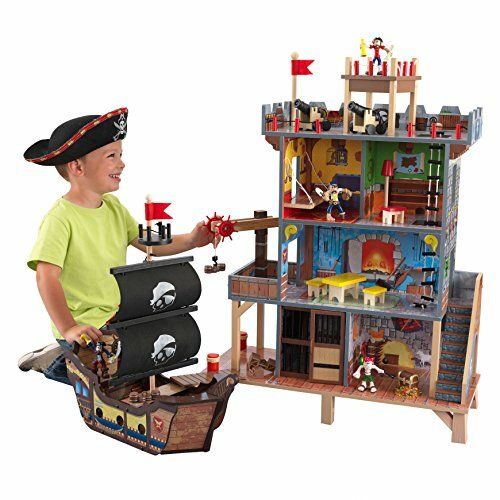 Whether it be a regular play house with family figures, a police station, fire station or even one that is pirate themed your boy is sure to have hours upon hours of fun over the years with a properly themed boys dollhouse. We hope you can use our guide to get all the info you need to know about the main details, pros, cons, recommended age ranges, as well as what makes each dollhouse stand out.